Even though this insight has been with me for many years, it only feels appropriate to share it now. This is possibly because what in the past may have appeared as far-fetched, or as unrelated to our current human experience, is now fast becoming a digestible reality. And, even though I have waited many years to put this insight down in writing, I am still preempting the larger events that will fully validate the immensity of the circumstances foretold here. For those of you that are emotionally sensitive and aware, this information will be both confirmational and integrative. For those of you for whom this is news, this information will serve to prepare you to respond instead of react to the inevitable events upon our collective experiential horizon. Within the next few years our sun is going to make the headlines. Discussions once kept for dedicated astronomy groups will enter the hallowed halls of broadcasting outlets like CNN (phonetically pronounced "see an end") and other mainstream media. Predictably, because these points of observation only discuss our human experience by commenting on "effects", and therefore remain ignorant to the causal point of our collective experience, they will inevitably discuss the increasingly strange and unpredictable behavior of our sun in a manner that causes mass fear. Ignorance, and the consequential "ineffectual" analysis it initiates, always causes fear. To believe that our sun would at any point attempt to "hurt us" is to believe that drug dealers are in some way responsible for drug addiction, or that politicians have the capacity to empower people. On a physical level this will cause much discomfort and inconvenience to humanities assumption that it is in control of God. Our power grids will shut down, often for days, our near earth orbiting satellites will be damaged, or have to be shut down to prevent damage, and many of our communication systems like cell phones and the internet will experience disruptions. This activity has already commenced; those of you paying attention will have noticed such occurrences taking place in the first week or two of December 2006, especially with our planetary communication systems. The weather will also become increasingly and fiercely unpredictable. This too is now a reality. On a mental level this will cause confusion within our thought processes; it will be hard to "think straight", to communicate with each other clearly, and even to understand concepts that once appeared straight-forward. Linear-thinking will appear to fail us and logic to miss the mark. We will also experience interference in our memory faculties (short and long term). On an emotional level we will experience waves of unexpected fear, anger, and grief. People who for the most part appear quiet, sedate, and controlled in their behavior, will become unpredictable. Unexpected emotional outbursts by public figures will become the norm. (These are already happening.) We will feel overwhelmed by emotional states indescribable to us. Emotional conflicts will escalate exponentially between individuals, groups, and countries. Pharmaceuticals that block authentic emotional states will become increasingly popular. On a vibrational level we may feel "spiritually disconnected" or increasingly aware, depending where our point of focus is anchored. The media, and all within our human family transfixed by "effects", will have their focus primarily on the above physical consequences of the sun’s increasing activity. Because their reaction to these circumstances will be unintegrated and therefore uninformed, this will incite fear. People will consider building underground bunkers and shelters to hide from the sun. Certain governments are already aware of this forthcoming solar cycle and you can be sure movements are underway to build underground facilities in hopes that certain select communities may outlive this imminent solar cleansing. There is nowhere to hide because nothing is chasing us but ourselves. For the most part our human family will struggle to make a connection between the escalating sunspot activity and the consequential waves of discomfort within our physical, mental, emotional, and vibrational fields. The intent of this article is therefore to preempt these circumstances in a manner that empowers is by providing some simple insight into what is unfolding, how this impacts us personally, and what steps we can take to consciously respond to this solar cleansing. Integrating this information will decrease our fear, empower us to move consciously in sync with this extraordinary event, and thus, through our individual example, to assist others in our field of experience. The best way to accomplish the intent of this article is to present a play-by-play account of what will unfold as the sun increasingly wipes the slate clean with its solar flares. We shall begin with the sun and work our way inward from there. A MASS CORONAL EJECTION OCCURS FROM SUNSPOT ACTIVITY THAT IS AIMED DIRECTLY AT EARTH: To begin with, the sun is not "the cause" of anything; the sun is an effect of activity coming from a deeper vibrational level of existence. The sun is "energy in motion" (e-motion), and in this respect is the emotional center of our solar system. The sun is an externalization of our collective and individual human heart center. It is the Heart Chakra of the family within our solar system. When it becomes active it means there is communication coming from the vibrational realm. Just as our heart center is the portal through which we communicate to and receive information from our vibrational field, the sun is this for the entire living entity that we call "our solar system". The perspective that "our sun is doing this to us" is therefore incorrect. Once upon a time we believed the sun orbited the earth, and then we awoke to the reality that the earth orbits the sun. For a long time we have also believed that the sun is the causal point of life on earth. Now it is time to realize that the sun simply transmits information, like a portal, from the vibrational causal point of all life. The information it transmits enables us to move "in formation" with the vibrational intent Life has for our solar system. When we are unaware of the sun’s activity, when we are ignorant of its cycles, we cannot integrate the intent of the pulse of Life within our solar system. Many cultures on earth understand this, though not with as much clarity as we are now about to. Most cultures only get as far as perceiving the sun as the causal point of their experiences; we are now entering a transformation in consciousness in which we are invited to embrace an even deeper awareness than this: That the sun is merely "a portal" into the causal point of all life. It is therefore a perceptual error to claim that "the sun is trying to hurt us". To believe this is the same as believing the sun is actually moving from east to west across our sky. The sun, like a radio or television set, does nothing of its own accord; it is a neutral system of communication that has to be activated from the vibrational realm to behave in any manner at all. When the sun exhibits a coronal mass ejection that is directed at planet earth, this means information is deliberately being delivered to us from the vibrational realm. When we go into fear we close ourselves off from this transmission and are therefore unable to digest what is being communicated. FOLLOWING A SOLAR FLARE, GEOMAGNETIC STORMS ARE ACTIVATED: Within a short period, usually about two days after the mass coronal ejection is seen on the surface of the sun, the earth experiences geomagnetic storms. It is at this juncture that the physical consequences of the solar event impact us. This can range from satellite damage to disruption in communication and power systems, from unprecedented weather activity to volcanic and earthquake activity. The earth is blasted by radiation (like we do to cancer cells during chemotherapy) and this is visible as auroras; light shows showering the earth from the northern hemisphere. This event is also known as The Northern Lights, and in scriptural prophecy, as "lights in the sky". Because our outer technological advances now override any intent to develop internal communication systems (insight and intuition) we now rely totally on the telephone instead of telepathy. We also rely completely on the internet over and above the inner infinite wisdom of universal mind. The telephone is telepathy externalized, just as the internet is universal mind externalized. There is no problem in the externalization of these inner capacities; it when we become addicted to their externalized forms in a manner that wipes out all awareness of their inner causal cores that we enter very unbalanced and self-destructive experiences. These specific perceptual imbalances, among many others, will be restored during the solar cleanse we now face. As outer communications are disrupted and break down we either awaken to, and begin utilizing and trusting our internal equivalents, or we lose touch completely. The consequences of loosing touch completely are that we make choices that are self-destructive. We have also settled in collective masses upon certain places upon the earth, driven by selfish profit margins and mental justification, in a manner that is completely ignorant of the nature of the earth as a living being. This is one of the reasons why we cannot hear the communications coming to us from the vibrational; we have plugged the earth’s senses with concrete just as we have plugged our own with outer noise, distraction, and physical addiction. These circumstances are about to be re-aligned with sudden earthly shifts, shrugs, and waves of unexpected weather and water. If we "listen" we will be informed that we are to move prior to such events. If we are living in an unbalanced externalized manner, through cell phones or inside computer games, it is unlikely we will perceive these inner communications. None of the physical consequences of the solar flares are intended to hurt us; we are already doing this to ourselves. The physical consequences of solar flares are the bitter pill the child of God must swallow because it is experiencing a state of self-inflicted dis-ease. The sun’s activity will only disrupt "our personal agendas". When we awaken to the Graceful vibrational intent of this solar activity, we will be grateful this portal is available to be used in this manner so that light may be brought to our ignorance and necessary obstacles to our arrogance. There is nothing we can or need do now about the physical adjustments that are to come and that are already unfolding across planet earth. If we attempt to enter the experience at this reactionary level we will enter fear (interfere). The planet does not need to be "saved by us", nor do we need to "save or be saved by anybody else". All that is required is an adjustment in our awareness at the causal point of our current experiences. Make this adjustment and enter "the flow". Entering unconscious behavior is inevitable in this dense realm of matter and so the vibrational realm sets up cyclic opportunities for all within this experience to periodically undergo a cleanse of perception and the consequential reawakening to vibrational awareness this cleansing activity triggers. This procedure actually unfolds internally, but all who have their awareness physically externalized and are thus addicted to believing the physical aspect of experience to be the causal point of life perceive these events as happening "out there". The reality is that what appears to be taking place "out there" upon the sun is simultaneously taking place within the individual and collective human heart chakra. The vibrational realm triggers these sequence of perceptual cleansing events by transmitting an intent to cleanse illusion to the sun. In our solar system, and in our externalized experience, this transmission is then witnessed by us as sudden explosive behavior by our the sun; as sun spots that eject flares directed at or near to earth. These flares, among other things, impact earth’s magnetic field causing geomagnetic storms. Because the individual and collective human magnetic field is inseparable from the earth’s magnetic field, a geomagnetic storm brews upon the face of the earth and simultaneously within the heart chakra of individual and collective human consciousness. This activity short-circuits our individual and collective ability to be selective about what memories we choose to acknowledge and what memories we choose to suppress. This causes deeply suppressed memories to begin surfacing within our conscious awareness; memories more ancient than any current historical record. Because our awareness is addictively externalized, we do not perceive these surfacing memories as "pictures in our heads", but rather as activity "outside of us" that causes increasing discomfort; these memories surface as escalating outer conflict and circumstances in our world experience that cause us fear, anger, and grief. Because our emotional body awareness is shut down we initially perceive and interact with these surfacing memories as "a sense of mental confusion". When we attempt to suppress these surfacing memories in any way, which we do reactively through course of habit, our body is physically impacted. This resistance causes an inner friction which manifests heat. It gets as hot as hell. Accordingly, within three weeks of solar flare activity there is an increase in heart ailments and strokes which are accompanied by individuals exhibiting extreme emotional outburst. It is also during this period that elderly people suddenly enter chronic states and die. It is also during this period that people who are by all accounts healthy suddenly manifest unexpected symptoms of disease. Most people cannot perceive that their sudden experience of outer conflict or bodily discomfort is a reflection of their suddenly increased sensitivity to the authentic condition of their own emotional body. Though reflected as various states of outer conflict, or as mental confusion, or as sudden eruptions of disease within one’s own body, the real identity of the deeply suppressed memories that are surfacing are not any of these; they are the emotional signature underlying all these experiences. In other words, energies within the emotional body that have been blocked, suppressed, or functioning dysfunctionally, are triggered directly by solar flares so that they can enter our conscious awareness and be compassionately integrated. Conscious integration of these previously unseen emotional dysfunctions gradually neutralizes the destructive behavior that is at the causal point of all individual and collective human conflict. Those who cannot integrate these surfacing energetic signatures either experience a breakdown in their physical body, to the point that their consciousness can no longer remain within it, or they react self-destructively to the outwardly reflected memories and enter combat with the illusions these surfacing emotional signatures reflect upon their outer experiences. This is what conflict is. In this manner, either through disintegration of the body, or through entering self-destructive conflict with others, all who are living from a point of illusion (being driven unconsciously by unintegrated memories) and cannot resurrect themselves from their delusionary behavior are deliberately and systematically removed from the play of human experience. Seers from our past and present civilizations have prophesized that in this manner it is possible we shall witness between one and two thirds of the earth’s population removed by reactive projections to this cleanse; namely, by disease and conflict. Those who respond consciously to the solar cleanse by taking responsibility for their experiences, by cleansing their emotional body so that they maintain mental clarity and physical presence, will be delivered through this shift into a state of a Being upon earth in which we once again collectively acknowledge the vibrational realm as the causal point of all life. This is how The Golden Age is always initiated; not through accomplishment of human technology, nor by the filling of the human brain with ideas and concepts, and nor by dissecting the physical world to try and understand how it works. The Golden Age is always initiated by solar flares (gold in color) energetically cleansing the generational dysfunctions within us that breed perceptual error. What this means is that it doesn’t matter whether we are rich or poor, well-educated or not, have status in society or not, and consider ourselves "spiritual" or not. Nor does it matter whether we are Asian, Indian, African, European, or America. Nor does it matter whether we are Jewish, Christian, Muslim, Hindu, or atheist. Nor does it matter whether we are democrat, republican, communist, or green party. Nor does it matter whether we are tinker, tailor, soldier, or sailor. None of our pretences and none of our beliefs about ourselves and about what we think God is can save us from having to face the authentic condition of our own hearts. The only response that can deliver us through and beyond this experience is honesty: being honest with ourselves about the authentic condition of our own hearts. We may believe we can continue to hide parts of ourselves from the world, yet, like God, the sun does not care what we believe. This solar cleanse favors only that which is real; that which has authenticity, integrity, and which is able to become as naked and vulnerable as a child so that innocent intimacy with all of creation is reestablished. There is also no point seeking shelter from this solar cleanse, for if we are in a human body, we come equipped with a personal magnetic field, and this magnetic field is intimately connected to the earth’s magnetic field, and the earth’s magnetic field responds precisely to the transmissions emitted through the sun. No matter how deeply we dig into the earth, we are still upon the earth. Trying to hide from this experience is like trying to hide from the beating of our own heart, or from our breath, or from the blood that runs through our veins; such reactive behavior is futile. There are many ways to react fearfully to this predicament, and we shall witness them all unfolding and escalating upon this planet. Yet, there is only one conscious response: To metaphorically turn and face the sun, listen, and absorb. In other words, to metaphorically turn inward and face the authentic condition of our heart, to listen to it, and to absorb the fear, anger, and grief we have hidden from ourselves within this place. Like the sun, our heart speaks to us through our discomfort. It says, "Resist the surfacing discomfort within you and you will burn up in the heat of the consequential friction created by such reactive behavior. Rather face the discomfort and ask: ‘What are you telling me, teach me to listen?’." When we open ourselves to this experience, when we work responsibly with our emotional discomforts with the intent to integrate all surfacing unconsciousness, we also discover that, like the impulses coming from within our heart center, these solar transmissions are imbedded with profound insight and information. They activate us; the rays emitted from our sun as solar flares "enlighten" us just as the release of suppressed emotional states do. This imminent solar cleanse is a beautiful reflection of what is happening within the very core of our being, individually and collectively. If our heart is blocked, God’s words appear as pain. When we hold onto the past, those that would free us appear as devils. When we open our hearts, the very same transmissions become hymns deliberately sung to awaken our souls from a long, cold, and lonely winter. And the hymns tell us, "Little darling, everything is alright." Also, before we naively buy into any abstract superstitions passed down to us from ancient cultures, let us remember that everything we have observed about any civilization that came before us has been "a record of their decent into ignorance". We do not know anything about the Egyptians at their peak, nor about the Toltecs, Mayans, or Aztecs at their peak. We only think we do. We can only perceive the nature of a civilization at their peak when we view it from our peak; we have not yet peaked. Once civilizations enter this repeated cycle of solar cleansing, which some say happens every 13 000 years, those that respond consciously to such a moment ascend into dimensions of being incomprehensible to physically transfixed beings. Such ascended beings metaphorically "rise up" and leave in their wake those individuals that make it through the solar cleanse but do not have the capacity to "rise to the occasion". These left-over populations continue on and live within the shadow of "what once was but is now gone". These surviving remnants are the groups of people who are discovered by civilizations yet again on the rise. This was the condition in which the Spaniards discovered the Mayans and in which the British and French discovered the Native Americans. These surviving groups from ancient civilizations still hold remnants of the knowledge of the solar cleanse, but because of the denseness of the physical world they inevitably resort to behaving as if the "physical experience is the causal point of life"; hence this knowledge once again becomes externalized and encased in outer ritual and ceremony. They then mistakenly believe in "The Sun God", instead of "The Son of God" we all are. Consequently, the Mayans left over from their Ascended Ancestors rip the hearts out of their people to honor The Sun God so that life will continue. They become lost in the metaphor which they ignorantly externalize into physical ritual. The sun is not asking us to rip hearts out of living people so that we may have life; as a portal of vibrational communication, it is transmitting the message that we must without delay look deeply into, and take responsibility for, the condition of our own hearts while we are still alive in the body, so that we may consciously cleanse the energetic blockages that are preventing us from realizing that the vibrational aspect of our experience is the causal point of all life. Once we realize this Truth experientially, we know that what we are can never die; then we are reborn into a conscious awareness of eternal life. The sun is not trying to hurt us; do not believe the keepers of "destination consciousness" - those that can only "see an end". Do not react to the fear of ignorance; rather respond to the Grace that now increasingly showers humanity from the vibrational core of all that is Life. Feel what is real and heal. Take your heart out from where you have hidden it while you are still alive and do the inner work that you may be blessed with the awareness of your authentic self. Make this sacrifice upon the ancient altar of your own experience so that your awareness may transcend the limitations of matter and enter the unlimited dance of immortality-consciousness. This website has short articles about all current space weather conditions written in ordinary human language, plus wonderful pictures. If there is a massive solar flare on its way, this site keeps us informed and covers some of the many physical consequences of such an occurrence. By monitoring the sunspot activity, the subsequent solar flares and geomagnetic storms, and then our own corresponding physical, mental, and emotional activity, we begin to see "a pattern of consequences". This empowers us to know that this is not something "happening to us that we have no control over", or "that this doesn’t have anything to do with our daily life experience". We are all intimately connected to each other, to this earth, to the sun, and to the vibrational causal point from which all the currents of life arise. No amount of applied sun-block lotion changes this. Re: Here comes the SUN. Solar cycles and their activity play an intimate part in the unfoldment of human consciousness. Solar flares affect the Central Nervous System (stomach lining), all brain activity (including equilibrium), all human and animal behavior and all psychophysiological (mental-emotional-physical) response. Solar flares can cause us to be nervous, anxious, worrisome, jittery, irritable, lethargic, have short term memory loss, feel nauseous, queasy, have prolonged head pressure or head aches, have trouble with the radio, phone, Internet, computers, and all forms of communication--both human and technological. Solar activity, although dramatic, catalyzes, and is essential for our evolutionary process by stimulating radical change and transformation in the organizational foundation of matter, energy and consciousness. Solar activity plays an intimate role along with the dynamic transition in Earth's precessional Cycle the Holy Cross which occurred around 2000 A.D. and which began the "time of change" in Earth's ~25,000-year "Evolutoniary Cycle of the Soul." Solar flare activity (and other star explosions, like supernovas) are the primary catalysts that stimulate a renaissance in consciousness. They provide the cosmic impulse that supports the evolutionary maturation of the incarnate soul--the illumination of consciousness that we all seek. To participate together in mutual acceptance of all that we have been and in celebration of all that we are becoming is to take hold of this evolutionary opportunity and graduate into the majesty of our Divine Destiny. Remember, solar activity illuminates consciousness, dissolving duality's paradox - the fear and judgment based monsters within are consumed in Light - old patterns of behavior vanish, while true elegance and majesty of self emerges. Unconditional Love banishes Fear - a choice. above the raging tempest of the old world. So, does the full Moon upset the balance (a shield as it were) of the Sun's effects on the Earth. Is it a respite to the forces to the magnetic field or does it enhance the conscientiousness and harmonics of the beings that dwell on the Earth? It has been known for centuries that the full moon can affect people’s consciousness and behaviour. Many people may feel wakeful at night with energy streaming through their body for the three days before full moon. It is only recently that I have discovered why this may be happening. NASA-supported scientists have realized that something does happen every month when the Moon passes through Earth's magnetic tail. Human consciousness too is made up of electrical activity – which can be measured with an electro encephalograph – and a magnetic aura, or field of energy. A lot of people can feel this field of energy; for example, when you smile you can feel the field of buoyant, glowing energy extending into your aura like the energy field of a magnet. I have often wondered why I am affected so much by the moon from three days before full moon to a few days after. The magnetotail provided me with the perfect explanation; as the moon charges up when within the tail and becomes much more electrical and magnetic, it is only normal that this increase in power should be felt on Earth. Human consciousness is also affected by sun spots and the mass ejections from the sun's corona; these are what cause the solar winds of magnetic energy which affect the Earth's upper atmosphere and give rise to the Aurora Borealis or Northern Lights. I feel it is beneficial if we extend our awareness to take in all these influences of the celestial bodies, as they all communicate with, and have an influence on, each other by the transfer of electrical and magnetic energy – which could also be called consciousness. Our body has a field of energy – the aura – which is the same as the aurora or magnetic and gravitational field of the planet. We are all One, a part of the Universal Life Force; and it is natural to be aware of the greater cosmic system, which is as much a part of our consciousness as our brain is. As human consciousness evolves and moves from the individual awareness to an awareness of greater integration within the whole cosmic system, we also expand our understanding of the unity of life and develop a love of all things, in the realization that We Are All One. "It was curious to think that the sky was the same for everybody, in Eurasia or Eastasia as well as here. And the people under the sky were also very much the same--everywhere, all over the world, hundreds or thousands of millions of people just like this, people ignorant of one another's existence, held apart by walls of hatred and lies, and yet almost exactly the same--people who had never learned to think but were storing up in their hearts and bellies and muscles the power that would one day overturn the world." Fire the Grid is all about waking humanity up so that we become conscious individual cells of light. Each cell of light radiates not only in itself, but for others as well. Fire the Grid III was about raising your own frequency, finding that moment of joy and giving gratitude, As each of our fields lit up, we plugged into the grid and tapped into the energy system of the planet, essentially raising our hands and saying "I'm here". My beings have told me conclusively that they can see us now and that there are enough of us. The second phase is called Fire the Grid II, and it is about using the power of “I” to unite once again to become “WE”. Just as with the first event, there is a corresponding date and time which have been given to me by my Light Beings. Much has transpired since that momentous day, and roughly 24 months later, there will again be incredibly powerful energy available for all humans to utilize on a new date. The energy I speak of is our own love energy we used on the first FTG event. On July 17th 2007 at 11:11 GMT, a Cosmic opening rained down a living, highly charged force full of awakening potential. It was infused with Source energy and it was available to all humans who wished to draw it to them. We are conduits, antennas if you will, and we accepted this energy, drew it into us, passing it through us into the water system in the earth below us. At the same time, the love energy of acceptance and joy and gratitude that we’ve nurtured and stored while the energy passed through us also passed through us into the water. The water system then took that energy throughout the planet and began a healing. It was to flow through the planet for a year and then to travel to Brazil where it is housed in a crystal bed under Brazil. Crystal is alive, an entity in itself and could even house one of us. This crystal bed has been housing the energy since July 17th 2008. It has been pulsating out its potential from its resting place under Brazil and this July, it will be ready to be released. This energy simply cannot stay here as there is an imbalance, so it must return to Source. As we all will someday. There is balance in everything. See it, believe it then create it. It is well-known that the Earth's magnetic field and crystalline grids, as well as the Sun’s output, are altering rapidly in conjunction with emanations from the Galactic Core as per the Mayan Calendar. Correspondingly, our DNA is altering rapidly as we, too, are being impulsed from the Sun and the Galactic Core to radically transmute ourselves at the subatomic level and to embody new frequencies, Light and the understanding that we are Source, Divine and Multidimensional in nature. These ‘vibrational falls’ have resulted in devastating genetic mutations and distortions, the severe compromise of our Original Crystalline Divine Blueprints, destructive conflict between men and women, ongoing warfare (and continued perpetuation of the Global Military Industrial Complex), and our ability to be one with Source and to thus co-create realities of Joy, Peace and Abundance. These ‘falls’ have been well-documented in many great stories – stories about the Lucifer Rebellion, the Atlantean Age and the Tower of Babel being only a few – and, of course, are directly reflected in the current state of crisis on the Earth. At this time, with solar flare increases and magnetic field drops, and with Transformer Pluto conjunct the Galactic Core, our pineal and pituitary glands are increasingly stimulated and our DNA is recalibrating itself. Consciousness is flowering, people are awakening from the ‘deep sleep’, and all manner of spiritual, mental, emotional and physical disorders are on the rise in an accelerated effort now to clear the old and align with the new. Galactic Core Attunement Sessions provide multidimensional, holographic assistance at this time to release the old programs that are incompatible with this evolutionary shift and to activate the codes within ourselves that will awaken each of us to our Divine Purpose and our Original Blueprints of Divine Perfection, and to the remembrance of how to navigate these shifting times effortlessly so that we can merge seamlessly with the accelerating frequencies. 1. the Seven Sacred Plates of Solar Consciousness which correspond to our Etheric Bodies, Seven Chakras and Earthly bodies. These Plates have lain dormant since the Atlantean Age, when their activation did not take place, their encodements were corrupted and much trauma resulted. These prepare the body for the merging with the Immortal Diamond Body which allows us to interface smoothly with the acceleration process into the Fifth Dimension at 12-Strands of DNA. 2. the Five Sacred Plates of Sirian Consciousness that exist beyond our Earth vehicles. These Plates create the Sirian Template Body of the Christ Matrix that facilitate the expansion into Seventh Dimensional Consciousness and 48-Strands of DNA. The Plates are light-activated (by the Galactic Core, the Sun and various celestial movements) during times of key change (such as ours) in order to facilitate radical transformation on subatomic and DNA levels. Essentially, the Plates are time-encoded gateways of consciousness that allow one to experience wise mastery of both Internal and External reality, as well as of Spirit and Matter. It allows one to stay in body, intact and in power – and to mulitidimensionally merge effortlessly with the Ecstatic Frequencies of the Divine that are exponentially impulsing all life at present. Ever wonder why its called the "Solar Plexus"
Fear, depression, weakness, adverse emotions? Concentration on Solar Plexus will help you. There is another name to the Solar-plexus. It is abdominal brain. We have sympathetic nervous system in our body. The sympathetic and the parasympathetic nervous system are parts of what is commonly called the autonomic nervous system (autonomic=cannot be controlled). Solar plexus is its important center. It is located in the Epigastria region behind the pit of the stomach. It controls the main internal organs of man. Research says it is playing much important part in our human life than generally acknowledged. It plays an important part in controlling our emotions and of various bodily functions. It is the store house of Prana. It is one of the most vital parts of our body. There are sixteen important substratums (Adhara) in our body and this organ is one of them. It is a well known fact that any severe blow on the solar plexus will instantly kill the person. Solar-plexus is in fact the Sun of the nervous system. When the Sun is shining harmoniously, the entire inside system is said to be harmonious. It radiates strength and energy to all parts of the body. When Prana and thought are directed towards this center through pranayama, it stimulates the sunshine latent (sleeping) therein. Sri Ramakrishna Parama Hamsa meditating on this center used to awaken the latent sunshine. He was sending flashes like from his body. Now let us consider how to practice this Yoga. I give a name to it. Sit erect on Padma, Sidda or Sukhasana. Close your eyes. Inhale the air slowly through your left nostril as much as you can comfortably do. During this keep your right nostril closed. Mentally chant OM. Then retain the breath. Have your attention well directed towards solar-plexus. Concentrate your mind there. Let your thought not split into. Direct your attention totally on that center. Note: no undue effort should be made. Practice it with ease and comfortably till you achieve perfection. Deliberately direct the prana to the center of the solar-plexus through the retained breath. You have to do it with ease. It comes by practice. You have to have pleasant ideas such as “I am bathing in prana, happiness, contentment, in the love of God, joy, strength, vigor, vitality and love”. Then slowly exhale from the right nostril. Then inhale through the right nostril as before, perform in the similar manner and exhale slowly through left nostril. Repeat this process for 15 times. This you have to do in the morning with empty stomach. NO TIME RATIO IS APPLICABLE FOR NEOPHYTS. ONE SHOULD NOT DO ASANAS, PRANAYAMA AND MUDRAS WHEN STOMACH IS FULL OR DURING THE DIGESTIVE PERIOD. DIGESTIVE PERIOD SHOULD NOT BE DISTRUBED. THIS IS THE MAIN REASON MANY software personal is having digestive problems or gastric problems etcetera. Crop circles have been occurring around the world for a long time, especially in Britain, and these have been very well tracked and documented by www.cropcircleconnector.com. In recent weeks, there has been a series of glyphs pointing to the occurrence of a substantial solar flare in association with the lunar eclipse on July 7th. Most of these patterns have been very skilfully analysed by those with the knowledge to do so - and, to me, some of this analysis is simply breathtaking in its detail and understanding. Thank you to all involved in this extraordinary work. Even looking at the patterns without the analyses, does anyone want to argue these beautiful gifts to humanity are man-made? What we have is a huge body of crop circle evidence pointing to a major solar flare on July 7th. So, is this supported by any forecasts from the scientific community? As I write this, it is July 3rd, 4 days from the forecast event. Here is a recent posting from NASA [link to science.nasa.gov] about this current cycle - no reference to this event. Here's another recent discussion about Cycle 24 - [link to www.radio-sport.net] It seems everyone thinks we're in for a quiet cycle... No talk of July 7th. Here is the forecast from NOAA - www.swpc.noaa.gov which, admittedly is only for 3 days - nothing. Nor at [link to www.spaceweather.com or at [link to www.solarmonitor.org . It appears not one of the mainstream forecasters are doing the kind of work we see at [link to www.cropcircleconnector.com] and they clearly don't monitor crop circles!! So even though there was evidence on June 4th pointing to a potential event 33 days later when the spot comes around again, no-one seems to be alert to it. STOP PRESS: As I am finalising this on July 4th, SpaceWeather.com has posted this today: NEW SUNSPOT: Sunspot 1024 is growing rapidly and crackling with B-class solar flares. "The energies did not come all at once, but rather in segments, because humans in their physical frame could not have endured such potent sources of change. These energies have come to the planet in surges that you recognise as solar flares. So there is one type of energy that comes through solar flares and there are other types of energy that come through eclipses and planets which configure themselves in patterns that those who study astrology would recognise." [link to www.cropcircleconnector.com] which shows flames around the tail of the phoenix, is the flame that consumes the phoenix a solar flare? So with this background, I was interested to see what messages, if any, our spiritual friends had for us in relation to this date. Were they saying there would be solar flares and if so, what impact would they have? And yes, they are saying there will be sunspot activity on that date. "There will be a blast of energy from the sun"
"..there is a blending of energies that have not come here to Earth in a very long time..."
"... immediate influence of the 7th will be changing something internally in the human body and that is a relationship in the ganglia in the brain.... the sequence in which messages move in the brain... perfect the method in which the synapses work... became skewed when the brain was divided in Atlantis..."
"also make changes in the animal brain... they will have more of an awareness... be able to communicate more directly with those they call pets... we believe it will be noticeable..."
"Another step forward in the human race having more direct consciousness/awareness of their Creator..... for those on a spiritual path, these changes in the brain will bring forth a great advancement in the awareness of the relationship between human beings and their God." "It is a marker. A very important marker." "What you see in the crop circles is showing energy as it moves and there are many recent crop circles showing how the energy is coming through, how it moves, but what we are giving you is the spiritual aspect of it." Recently I wrote a piece entitled "Where's the evidence for a 2012 event?" (Click on [link to Do_not_use_this.com] to download it). In it I express what I see as the importance of tangible, irrefutable evidence that "Joe Average" cannot ignore as to what is unfolding at the end of 2012. Does this prediction, based on the crop circles and now Carolyn's message, in the absence of any scientifically forecast event constitute such evidence? In my view, it is a powerful step forward, because we have a prediction and we will have an event that is visible in the world, so it gives credibility to these sources. However, it is not something that is likely to gain the attention of humanity in general, although it is something you and I will be able to refer back to and I encourage you to share it widely. "Truth will manifest itself. Truth will not come close to manifestation and then turn away, come close to manifestation and turn away, come close so that it is almost within your grasp and then like a wispy cloud it is not in your grasp at all. And when you have a set of circumstances that operates in that manner you can be pretty sure that this is the dark." And so it is an important marker in this sense - we have an event forecast by those of the light which, in short order, will be visible for the world to see. This is a marker for lightworkers. And in a sense it is a good thing that this is not an event that "Joe Public" will experience as a wake-up call, since the lightworkers of the world are not ready to support them. Few are aware that the reign of the dark across the cosmos has ended, as this much longer cycle is ending at 2012 also. It began in March, 2009 when Bealzebub, the leader of the fallen cherubim, those ultimately responsible for creating the forces of darkness, returned to the light. Recently the cycle of the dark was declared complete and all of the remaining dark ones have a clear choice - choose to return to the light or have their souls deconstructed, losing all memory and be reconstructed as beings of light to begin a new journey. This process has begun and the damage caused by the dark across the cosmos has been healed. And now it is time to break the grip of the dark on those present on this beautiful planet called Earth, and it begins with the lightworkers so they may complete their missions in preparing humanity and planet Earth for Ascension. And the same law applies - the dark ones either return to the light or their souls will be deconstructed. Their reign of terror, manipulation and destruction is at an end - and only love awaits them either way. So note this foretelling by Mother Mary and Lord Metatron and observe the unfolding of this truth come July 7th. It is a truly wondrous moment. To listen to the recording, go to [link no longer available] It is a phone recording at this stage, so the quality is not wonderful, however you can readily hear the content. As usual, I will upgrade it when I have the quality version. I anticipate I will not have to provide you with an initial phone recording for more than another couple of months, which will be better for all of us!! Blessings, Joy, Love and Peace. RA: I am Ra. The fourth density is a vibrational spectrum. Your time/space continuum has spiraled your planetary sphere and your, what we would call galaxy, what you call star, into this vibration. This will cause the planetary sphere itself to electro­magnetically realign its vortices of reception of the in-streaming of cosmic forces expressing themselves as vibrational webs so that the Earth thus be fourth-density magnetized, as you may call it. This is going to occur with some inconvenience, as we have said before, due to the energies of the thought-forms of your peoples which disturb the orderly constructs of energy patterns within your Earth spirals of energy which increases entropy and unusable heat. This will cause your planetary sphere to have some ruptures in its outer garment while making itself appro­priately magnetized for fourth density. This is the planetary adjustment. A NASA press announcement on December 16, 2008 revealed that a giant breach has been found in the Earth magnetic field. The magnetic field shields the earth from the solar wind which consists of plasma energy transmitted from the sun. For the entire duration of the next solar cycle, especially during its peak, plasma energy will pour in through the breach which is four times larger than the earth. In part one of this series of articles, I showed how each individual’s bio-electrical system will become increasingly charged as the sun ramps up its outpouring of plasma for Solar Cycle #24. As bio-electrical systems are charged up, many will feel this most immediately as surges of nervous energy. If individuals prepare correctly their bodies and nervous systems, the increased plasma energy can lead to a significant enhancement of human abilities. The human nervous system is made up of billions of neurons that communicate information to one another and the body’s trillions of cells. Robert Becker, in Body Electric, revealed that neurons transmit information through tiny electrical signals that are very sensitive to the electrical environment. This was why living near electrical transmission wires can be very damaging to the body’s sensitive bio-electrical system. Similarly, large electrical discharges or shocks can severely disrupt the human body. The precise effect of a tremendous increase in solar plasma energy in the Earth’s electrical environment upon the human nervous system is unknown. Its effect on human relations and society is even less known. It can be predicted, however, that the surge in electrical energy on the planet and human bioelectrical systems will directly influence relations and communications between people. This arises from the tiny bio-electrical signals that enable the brain neurons to communicate. Brain cycles represent the dominate ways our neurons communicate when organizing sensory data about the world around us. During waking time, we typically operate using two brain wave states. Beta is where our brain’s electrical signals operate between 14-40 cycles per second or Hertz (Hz) and represents a state of high mental activity typically associated with stress. Alpha brain wave states operate at 7.5-14 cycles per second and represent a relaxed state of mind. Lower brain wave states, Theta (4-7.5 Hz) and Delta (0.5-4) are physically inactive states such as deep meditation and sleep. The highest recorded brain wave state, Gamma (40+Hz), represents bursts of insight and has been increasingly observed in the use of higher cognitive abilities by children. As the plasma energy pours into the earth, people’s brain wave states will be affected. For some, this might be experienced as communications and interactions becoming more intense as more beta brain wave activity takes place. An analogy would be someone who has lived all their life in a relaxed small town in the American mid-West, suddenly being transported to a busy New York City. Alternatively, others may find that their body lacks vitality due to a rapid build up of static electricity in the Earth’s environment. Those able to express the body’s increased nervous energy in constructive ways, will find it much easier to start and complete projects they previously put on back burner of life. The ability to easily switch between Gamma and Alpha brain wave states will lead to greater creative insight as individuals need to calmly respond to a more challenging socio-economic environment. The key to benefiting from increased Gamma brain wave activity is to keeping a positive and open mind where new insights are integrated. Once the brain’s higher cognitive skills come on line, then it’s vital to be able to calmly integrate new insights into our lives. By keeping an open mind and having a positive outlook individuals are most likely to succeed in dealing with the solar waves pouring through the giant hole of the Earth’s magnetosphere. They will be prepared for the rapid increase in plasma energy that will increases levels of electricity in the environment, and alters human bioelectric systems and brain wave patterns. Individuals who adequately prepare themselves will literally become solar wave riders able to ride the waves of incoming solar energy to higher levels of creativity and life fulfillment. During his upbringing in Hawaii, one of President Obama’s favorite beach activities was body surfing. He can combine this skill with his understanding that scientific “facts demand bold action." He can do much to help others surf the upcoming solar waves by taking “bold action” to help people deal with this fact by helping open their minds and exercizing their creative abilities response to a rapidly changing social environment. This can be most effectively done by disclosing the truth about a great number of areas previously kept secret from the American public. Arguably the most challenging national secrets are those concerning UFOs and extraterrestrial life. If indeed extraterrestrial life exists as evidence suggests, then disclosure of such evidence would be part of the “bold action” President Obama could take in helping Americans people prepare for the incoming solar waves. Perhaps nothing would more open peoples minds than the realization that extraterrestrial life is real, and has been visiting our planet. The next solar maximum will last for several years with one peak expected to be the year 2012. The giant breach in the Earth’s magnetosphere means increased solar activity will directly impact people’s bio-electrical systems and brain wave states. As the current global economic meltdown proceeds with lost jobs and increased uncertainty, this is a good time to explore options in how to best express one’s creative energies. By keeping a calm open mind while being creative in a changing socio-economic environment and integrating information about extraterrestrial life, individuals can become solar wave riders where they creatively deal with waves of solar energy pouring into the planet up to 2012 and beyond. Above: A computer model of solar wind flowing around Earth's magnetic field on June 3, 2007. Background colors represent solar wind density; red is high density, blue is low. Solid black lines trace the outer boundaries of Earth's magnetic field. Note the layer of relatively dense material beneath the tips of the white arrows; that is solar wind entering Earth's magnetic field through the breach. Credit: Jimmy Raeder/UNH. "To the lay person, this may sound like a quibble, but to a space physicist, it is almost seismic," says Sibeck. "When I tell my colleagues, most react with skepticism, as if I'm trying to convince them that the sun rises in the west." Here is why they can't believe their ears: The solar wind presses against Earth's magnetosphere almost directly above the equator where our planet's magnetic field points north. Suppose a bundle of solar magnetism comes along, and it points north, too. The two fields should reinforce one another, strengthening Earth's magnetic defenses and slamming the door shut on the solar wind. In the language of space physics, a north-pointing solar magnetic field is called a "northern IMF" and it is synonymous with shields up! The Incan and Ayamara elders selected Feb. 14th (Valentine's Day) for the ceremony to Activate the Solar Disk at Lake Titicaca. The cosmic ceremony heralds the physical re-emergence into the earth's atmosphere of those called The Children of the Sun. These are the ones destined to usher in the golden age of peace and harmony on earth. On Feb. 14th, we will be present with people from all over the world who have been called to Lake Titicaca to hold sacred the energetic frequencies of the New Earth. All the ancient prophecies point to these powerful times. They tell us that the Light of the Sun will return to earth, opening the hearts of the global family. This is the portal that floods the earth with the golden rays of the Divine Feminine sweetness. We ask you to join with us on Sunday, Feb. 14th in your services, your meditations, your practices, or in groups and hold sacred this day. Some of the Prism of Light Anchors will meet at the Prism anchor location, so contact them if you're interested. Using the imagination, see yourself entwined with thousands of us at Lake Titicaca. See the sacred fires being lit as the many elders and shamans perform ceremonies that call in endless blessings of spirit for the entire planet. See the web of humanity opening heart centers to the Source of All. Feel divine wisdom and love pouring through the portal that is being opened. Imagine all of us holding sacred space and activating loving joy into our own heart centers. See an infusion of love and joy releasing and eradicating the fears and anxieties that have burdened us for so long. See our heart centers anchoring Universal Love and Light into all the people of earth. See the global family finally soaring to its perfect spiritual state of joy and happiness. You are asked to Activate the Sun's Light Within You on Feb. 14th for the global heart of humanity. The perfect time will be whenever you feel called upon to link up with us. That is the time known as the zenith hour. We hold you in our hearts that day as we celebrate the return of the Children of the Sun as the Spiritual Sun is ignited. 1. What is a Hyder flare? Flares are intense brightenings that occur in the solar chromosphere. Flares are generally observed from Earth using narrow band filters, typically with a bandwidth of less than 0.1 nm, and often centred on the Hydrogen-Alpha wavelength of 656.3 nm. (Flares also have counterparts, that is, sudden outbursts, in the radio and X-ray spectrum). Most flares occur around active regions associated with sunspot groups. However, occasionally a flare (sudden brightening) is observed well away from an active region or sunspot group. These flares are invariably associated with the sudden disappearance of a large (thick, long, 'bushy') dark solar filament, and are termed Hyder flares. "Hot gas frequently erupts from the Sun. One such eruption produced the glowing filament pictured above, which was captured in 2000 July by the Earth-orbiting TRACE satellite. The filament, although small compared to the overall size of the Sun, measures over 100,000 kilometers in height, so that the entire Earth could easily fit into its outstretched arms. Gas in the filament is funneled by the complex and changing magnetic field of the Sun. After lifting off from the Sun's surface, most of the filamentary gas will eventually fall back. More powerful solar eruptions emit particles that reach the Earth and can disrupt manmade satellites. The cause and nature of solar eruptions are the topic of much research." Eons ago, during the final destruction of the ancient lands of Lemuria, a call was sounded that was destined to be heard in another time by the people of the earth. This call carried a resonant frequency through time and space; held in certainty that the Children of the Sun would return some day in the future to activate a loving heart consciousness on earth. For those who heard it, and even for those who didn't understand it, the call promised to open heart-centered love, caring, and compassionate feelings in the global hearts of humanity. The first sounds of that universal heart-centered focus was felt nine years ago when the world learned about the 9/11 attacks and responded in a wave of universal caring. It sounded again in 2004, delivering loving compassion and aid to the victims of the Indonesian tsunami long before world governments chose to respond. When a catastrophic earthquake destroyed the country of Haiti in early January, the outpouring of humanitarian aid was immediate as people chose to personally respond and go to the island nation to help. Sometimes, catastrophe and tragedy are the catalysts for opening the heart-centers. At other times, there's a different catalyst. People are brought together to hold the consciousness that doorways must be opened which speak to a new time dawning on earth. That time came when groups from around the world were called to Lake Titicaca, 12,500 feet high up in the Andes, for a ceremony called the Activation of the Solar Disk on Valentine's Day, Feb. 14, 2010. These groups, hearing the ancient call, brought forth an outpouring of the Divine Feminine compassion and heart love, which flowed from the center of the sun to the global family on earth. Thousands more from around the world who also heard the call but who could not be present, chose to participate in their own physical locations. This is the story of a small group of women, an enclave in the larger group, who also heard the call but who came with individual visions and deep knowing of their roles in this gathering. They journeyed to Peru from different parts of the world to be part of the ceremony. They came from Europe, the British Isles, the West Indies, South America and North America. Most did not know one another before arriving, yet upon meeting there was an instantaneous familiarity with each other. It was clear that they had come out of time, out of space, and from great distances to reconnect in a way that would unite their hearts once more in a most unique yet familiar manner. While the larger group gathered at different places during the four days of the various activation ceremonies, this enclave was destined to keep its own vigils, all of them receiving clear and unmistakable personal guidance and counsel. There was a unanimous feeling that on Feb. 14th when the main group was at Amantani Island, this group would return to the Aramu Muru Portal to hold sacred ceremony. The ancient legends say this portal was the place into which Aramu Muru, one of the twelve master teachers of Mu, disappeared with the golden sun disk. If Feb. 14th was in fact the "Re-Activation of the Solar Disk" it felt purposeful and right that we hold open the Divine Feminine Heart-Gate by returning to the place where the disk was last seen centuries ago. As if blessing that decision a large golden aurora appeared around the sun directly overhead. A private van was hired to take us to the portal. Unlike the previous day when three huge groups had converged on the portal at the same time, this time we were completely alone for more than five hours. With the Aramu Muru doorway as backdrop, a sacred altar was set in front of it using the mesa belonging to one of the women who was a Shamanic Mesa-Carrier. Each woman placed a sacred object on the altar, signifying something important in her life. A hat which had been around the world with its owner represented the journey we'd all come on. It was placed at the top of the altar. Photographs of spiritual teachers, mentors, absent friends, crystals, stones, incense and holy waters were placed on the mesa. The altar was then sealed and outlined with sacred ceremonial white quartz-crystal sand from Siesta Key Beach in Sarasota. It was not until much later that we realized the sandy outline of the altar was a mirror reflection of the portal above it. Without any direction, each woman automatically assumed a role as though she had done it for ages. A palo santo (holy wood) fire was tended which served to light eight candles representing the major religions of the world. The shamanic Mesa-Carrier called in the blessings of the directions. As she invoked the Eagle and Condor of the East, the winds picked up and the sound of wings flapping from a large bird could be heard nearby though none of us saw it. Our ceremony was universal in nature. We lit a candle to each of the eight major religions of the world, including the unknown. We chanted a sacred chant that represented each of those religions. We said a prayer and set it into the atmosphere. We prayed that all who came after us to visit this portal would feel the peacefulness and the opening of their hearts and that they would carry this back to their home countries. Then we sat in silent meditation. In this Solar Activation Ceremony we knew we'd joined with people from all over the world. Hundreds of you had written after reading the February Spirit of Ma'at issue about the Solar Disk Activation saying you would be part of the ceremony in your home locations. During this opening of the heart center, and this outpouring of Divine Feminine grace and love, we felt your presence. We knew you were with us during our silent meditation. We heard your voices join ours as we chanted Kadosh, Kadosh — Kyrie Eleison — Gate Gate Para Sum Gate — Om Mata Om Kali Durga Devi Namo Nama — and other holy chants. We knew you stood with us, as the Divine Feminine sweetness opened our hearts and poured out loving grace onto the global family on earth. We were held in the energy of the Portal, and we felt united with you in every aspect of that ceremony. There were many things experienced in Peru most of which could fill dozens of articles for this magazine. But the reason each of us went was to personally answer a universal call that we sounded into the cosmos eons ago. The human family had to elevate its consciousness from darkness to light in order to hear the sound once more. At 12,500 feet above sea level we set aside the distractions of this world. A magnificent group of women united with thousands from all over the world. They acted as carrier waves to the wonder of heart-centered love that was being directed to all inhabitants on the planet. Aligned at the portal, with the center of the Sun Disk and with the Galactic Center, we seeded the true sounds of Universal One-ness that is to become manifest in the times ahead. We summoned all the names of the Divine Feminine through time, invoking her grace upon us. In the opened heart-gate we offered this prayer: May all beings find joy! May all beings find happiness! May all beings stand in communion with one another! Peace, peace, and more peace. It is the self within ourselves that we have to sacrifice. It is our own heart that has to be torn out of the false being and offered to the light. May Xiuhtecuhtli, Lord of Fire, burn my false being, May Itzli, Obsidian Knife, liberate my heart. To sow life in the fires of sacrifice: Are the flames rising on the Hill of the Star, toward Cauhlacan? Or is it my own heart that is afire? The cycle of years is past - the waiting ended. Come - reunite, pilgrims, for the sky is in flames! From Xochicalco to Teotíhuacan the red spreads one step, another step, and another, only twelve short steps from the cave of the womb to the final conflagration... The flames rage in consummation- Rise, oh flames! What light, what heat! What great holocaust! The smoke ascends and spirals... Obscurity disappears as the flames rise to Tonatiuh, the purest light. "Take care of the light that I leave within my temple. When you form the human being, teach him to venerate my house, for within it they will find the light they need for eternal life. Teach him also that if he should stray, due to his errors, vices or ignorance, then I, Hunab K'u will reclaim my beloved beings and take them to my temple of wisdom and nourish them again with my light which is in the heavens. Then, together, Tepeu, Gugumatz and Huyubcaan will perform purification rituals using that brilliant light for the benefit of my beloved whom we created and molded, so they can live in the light of eternal wisdom." House bright and dark of Heaven and Earth, for the [solar] ships put together; Great Pyramid, House of the gods with pointed peak; for Heaven-to-Earth it is greatly equipped. House whose interior glows with a reddish Light of Heaven, pulsating a beam which reaches far and wide; its awesomeness touches the flesh... House of Eternity: its foundations are stones, the water; its great circumference is set in the clay. House the rightness of whose howling the Great-Ones-Who-See-and-Orbit bring down to rest... Mountain by which Utu ascends... whose deep insides men cannot penetrate. Both the Egyptian and Mayan hieroglyphs are descendant forms of the ancient logographic Sanskrit, as deciphered by epigrapher Dr. Kurt Schildmann (1909-2001). This antediluvian proto-Sanskrit can be identified as the Atlantean script, having been found on all inhabited continents of the world on stone and ceramic artifacts dated to the Pleistocene period - being over 12,000 years old. The pyramid traditions of these cultures of Atlantean descent provide us with stunningly explicit descriptions of future events tied into the ancient Sanskrit conception of water as the transformative agent of consciousness. The Atlantean psychoacoustic technology of quartz crystal skulls reflects the Sanskrit tradition of augmenting consciousness through the purification and crystallization of the water within the human body. The refraction of light within the human body that is fueled by crystalline water enables the higher capacities of human consciousness by biorhythmic alignment at 1.45 Hz heartbeat entrainment in the pyramid chambers. The Great Pyramid's upper chamber does not contain a sarcophagus - the granite box was actually a water-birthing resonator filled with celestial water. The closed shafts rising from the chambers are its "deep insides men cannot penetrate", designed to focus infrasound heartbeats at 1.45 Hz into the tiny newborn infants. Usually born as twins, the infants' skulls were elongated by this process. The celestial waters of La Maná, Ecuador and Tlacote, Mexico have been extensively studied for their astounding resonant properties. Test results have shown the spring waters of La Maná and Tlacote have the highest water purity found anywhere in the world, containing virtually no salt or other dissolved solids. This in itself is remarkable, but tests have also identified trace amounts of gold and silver nanoparticles and an energy rating of over 1,000,000 on the Bovis scale. There is no modern technology capable of creating energized waters like those flowing from the springs of La Maná and Tlacote. These celestial waters are the nano-technological product of the transdimensional civilization of Atlantis - the central component of the pyramid kundalini tradition of psychoacoustic gestation and water-birthing practices. Among the artifacts found below the sacred site is a large stone lingam in the form of a kundalini cobra, engraved with complex UV-fluorescent inlaid patterns - as well as a gold psychoacoustic helmet, accompanied by dozens of ceramic figurines that show both adults and children using the helmets while barefoot for electrical contact to the pyramid. The largest stone artifact from La Maná is a breathtaking global map of the Earth with all the continents accurately depicted as they were before the fall of Atlantis! Star maps on flat stone plates were inlaid with UV-fluorescent calcite mortars depicting the constellations surrounding Orion, with Betelgeuse (fluorescing in red) as one of the three large stars forming the Winter Triangle with Sirius and Procyon. This star map is also presented on the largest goblet (above, center). Tlacote is a great assembly point of the ancient gods where once existed the Golden City of the Golden Water, built by the Chichimeca and the Chichicastl. In other times, our ancestors left us transcendental information... Man has always been looking for something else, something that lives inside of him, and he recognized the inner light manifesting in his heart. It is this inner light that will cause the changes in humanity and that will make the dream come true, that the animal which is the human being will be able to live thousands of years. Man opens his heart to understand the revealing truth, creating consciousness and elevating his thoughts. This process is necessary, because we must understand and solve the enigmas of earth and the planetary system, in order to develop in perfect conscience right from the beginning of creation. We meet thousands of phenomena in our life. Man calls this coincidence; spirit calls it cycles of comprehension in the evolution of man. Therefore, if a new race emerges to a new cycle of existence, this happens because the information imprinted in the subconscious of the Inner Self has been completed. This message predicting the awakening of the Golden Water is sacred and was created and given to us by beings from other dimensions, so that other generations can be born, prepared for the great changes that will be produced from the center of the earth. Not only are the acoustic environments enhanced at these sacred sites, but the quality of water is also correspondingly enhanced to become crystalline. These profound findings reveal the sophisticated yet invisible technologies that enhance human consciousness and longevity at these sites - for those who choose to live close to spirit and purify their bodies to be bathed in the energy of the pyramids. The red light scattering of golden celestial waters induces DNA enhancement through heartbeat synchronization. The ancient Hopi wisdom echoes that maintained by the Maya, describing the imminent shift from the second phase of Creation, during which the sun has shone yellow, to the third phase of Creation during which the Earth is bathed in red light: ÒThe third phase of Creation is the time of the red light, Talawva, the perfect light. Humanity then, having been fully formed and [crystallized,] proudly faces the Creator for the first time, to know the true warmth of love.Ó While the Hopi prophecies ascribe no calendar date to the coming of the red light of the new solar age, their wisdom perfectly harmonizes with that of the Mayan culture, with its profound and complex calendar system providing the end date of December 22, 2012. Betelgeuse is enshrouded by vast clouds of gas and dust, so measuring its size is difficult. To cut through this cocoon, Charles Townes of the University of California, Berkeley, and colleagues used a set of telescopes that are sensitive to a particular wavelength of the star's infrared light. The team used these instruments to measure the size of Betelgeuse's disc on the sky. Over a span of 15 years, the star's diameter seems to have declined from 11.2 to 9.6 AU (1 AU, or astronomical unit, is the distance from the Earth to the sun)... The cause for this reduction is unknown, as it is unclear how red supergiants behave near the end of their lives. One may easily identify similar patterns in the energy fluctuations of both red supergiant Betelgeuse and our own small yellow Sol. The contraction and collapse of Betelgeuse is being mirrored on the Sun, which has seen a prolonged period of spotless inactivity for the period of 264 days preceding the appearance of Sunspot 1024 in July of 2009. Both stars dimming together represents the contraction before the full strike of the wave, as the supernova's energy reaches the Earth. Plasma physicists proposing the Electric Universe theory have keenly observed the pulsed throughput of energy that generates the dynamics of stellar interactions, overturning the false notion of stars as independent thermonuclear generators with their own self-determined lifecycle. The lifecycles of stars are actually intertwined with the cycling waves of energy that traverse the spiral arms of our galaxy. Galactic waves are generated as pulsations of infrasound emitted from the center of our galaxy that traverse its arms, gaining momentum from the radiated energy of supernovae that are set off by the wave's influence in a chain of events moving outward. Red supergiant Betelgeuse, at the shoulder of the constellation Orion, is the nearest in a chain of supernovae events along the expanding wave front, and acts as our local indicator by which we can estimate the arrival time of the galactic wave. Further analysis of the data obtained by the UC Berkeley team should also provide the rate of acceleration of the stellar collapse and give us a fairly good estimate for the moment of supernova. Considering the fact that Betelgeuse is our close neighbor at about 600 light-years distance, this event has already occurred and the nova will be visible to us in just a few years time. So, when exactly will the electromagnetic wave hit Earth, and how will it affect us? Certainly, the Betelgeuse supernova will be seen as a major flash of light plainly visible even during the daylight hours. The 'nova may shine very brightly for many days. The more complex unfolding of events triggered by the supernova involve many factors not commonly understood by astrophysicists. For time indications of the potential hazards and benefits of these electromagnetic changes we must turn to the most ancient and most accurate calendar system known to man. Mayan wisdom gives us an exact date for the change of the ages (December 22, 2012), and an exact sign is given as well - the Red Sky. The Maya use of sacred celestial waters within the pyramids for healing and longevity is an open invitation to sacrifice the false comforts of urban society that disrupt the natural acoustic environment and isolate people from electrical contact with the Earth. Industrial man finds dissonance and disease in concrete boxes, whereas resonance and longevity are to be found in the celestial waters and barefoot lifestyle practiced at sacred sites. The Maya invite us all to come together as one: "The cycle of years is past - the waiting ended. Come - reunite, pilgrims, for the sky is in flames! From Xochicalco to Teotihuacan the red spreads one step, another step, and another..."
Grandfather spent the next four days at the cave entrance, though for those four days nothing spoke to him, not even the Earth. He said that it was a time of great sorrow, of aloneness, and a time to digest all that had taken place. He knew that these things would not appear in his lifetime, but they had to be passed down to the people of the future with the same urgency and power with which they had been delivered to him. But he did not know how he would explain these unlikely events to anyone. Surely the elders and shamans of the tribes would understand, but not society, and certainly not anyone who was removed from the Earth and Spirit. He sat for the full four days, unmoving, as if made of stone, and his heart felt heavy with the burden he now carried. It was at the end of the fourth day that the third Vision came to him. As he gazed out onto the landscape towards the setting Sun, the sky suddenly turned to a liquid and then turned blood-red. As far as his eyes could see, the sky was solid red, with no variation in shadow, texture or light. The whole of Creation seemed to have grown still, as if awaiting some unseen command. Time, place and destiny seemed to be in limbo, stilled by the bleeding sky. He gazed for a long time at the sky, in a state of awe and terror, for the red colour of the sky was like nothing he had ever seen in any sunset or sunrise. The colour was that of man, not of Nature, and it had a vile stench and texture. It seemed to burn the Earth wherever it touched. As sunset drifted to night, the stars shone bright red, the colour never leaving the sky, and everywhere the cries of fear and pain were heard. Again, the warrior spirit appeared to Grandfather, but this time as a voice from the sky. Like thunder, the voice shook the landscape. "This, then, is the third sign, the night of the bleeding stars. It will become known throughout the world, for the sky in all lands will be red with the blood of the sky, day and night. It is then, with this sign of the third probable future, that there is no longer hope. Life on the Earth as man has lived it will come to an end, and there can be no turning back, physically or spiritually. It is then, if things are not changed during the second sign, that man will surely know the destruction of the Earth is at hand. It is then that the children of the Earth must run to the wild places and hide. For when the sky bleeds fire, there will be no safety in the world of man." Grandfather sat in shocked horror as the voice continued. "From this time, when the stars bleed, to the fourth and final sign, will be four seasons of peace [that is, one year]. It is in these four seasons that the children of the Earth must live deep in the wild places and find a new home, close to the Earth and the Creator. It is only the children of the Earth that will survive, and they must live the philosophy of the Earth, never returning to the thinking of man. And survival will not be enough, for the children of the Earth must also live close to the Spirit. So tell them not to hesitate if and when this third sign becomes manifest in the stars, for there are but four seasons to escape." Grandfather said that the voice and red sky lingered for a week, and then were gone as quickly as they were manifest. Apache Grandfather Stalking Wolf experienced visions of the dramatic changes that have since occurred, and are yet to come, providing us with the culminating event marking the emergence of a new solar era. However, there are multitudes of more subtle signs of these oncoming electromagnetic changes that can be understood only in this context. The effects of shifting gravity and enhanced electromagnetic fields have been documented all over world, especially in areas where we find pyramids, or megalithic structures. Research in Sevres, France has measured the subtle gravity change in their calibrated kg weight system, which is measurably offset to different degrees in different locations. These electromagnetic fields are focused by the axis-symmetric geometries of the pyramids of Giza, Egypt, thereby redistributing solar energy into a fixed global pattern of infrasound standing waves. These patterns of infrasound resonance have even been observed by satellite on the night of December 7-8, 2001, in the infrared spectrum. This invisible, prime force of Creation is heating waters through freezing winters in Minnesota, boiling seas off Sicily and even acoustically levitating large sandstone boulders above forests in Gushan, China and into tall trees in Limon and Yellowwood State Parks in Indiana. Deeply resonant humming heard in these infrasound hotspots is continually generating millions of reports of disturbance and annoyance worldwide, with new telephone hotlines even fielding calls from concerned residents to quell the panic. Deep infrasound booms like heartbeats have been reported in Llanidloes, Mawnan, Bridlington, Auckland, Sydney, Klai, Ranchlands, and in the US in Anderson, Kimberley, Richmond, Wilmington, Knoxville, Mobile, Knob Noster, Denver, Seattle, Arroyo Grande and Atwater. What is initially perceived as an annoyance quickly becomes a clear and present danger, as the infrasound resonance starts to overload all metals and wires with electricity until the extreme heat ignites fires. As Stalking Wolf emphasizes, "when the sky bleeds fire, there will be no safety in the world of man." All of the modern electrical technologies of humanity will not only cease to function, but will endanger human beings by spontaneous combustion. The surprising ignition of plastic-sheathed copper wiring was first noted in 1859 when a massive solar ejection shorted out and then ignited telegraph lines across the entire United States and all of Europe, and auroras were seen as far south as Rome and Hawai'i. Periods of elevated infrasound resonance have generated hundreds of fires in homes across the world. These resonant fires are located in the nodes of an infrasound standing wave pattern that is increasing in intensity, eventually requiring the complete evacuation of residents from areas like Tenerife, Babura, Lalapansi, Mapuve, Bodibe, Landovica, Peschici, Berici, Messina, northern Greece, Kishtwar, Ratria, Santo Tomas, and in the US in Colorado Springs, San Mateo, and Santa Barbara. A grave danger to personal safety in these regions of infrasound resonance will be posed by cellphones, which will ignite spontaneously in the pockets of clothing, as discovered already by one unfortunate man in Vallejo, California. Such surprising events will be an inevitable occurrence in the years to come. One of the most interesting incidents of this kind recently occurred in Soesterberg, Netherlands where, on the morning of July 19, 2009, ball lightning descended on the town in an unprecedented series of events. Residents reported fast-moving ball lightning in more than 100 homes that sustained extensive damage to electrical systems. One eyewitness described a purple beam of light that shot skyward through the roof of one home. The fact that nobody was injured in Soesterberg is remarkable. The two men aboard the international space station heard a strange metallic sound again Friday, four months after being startled by it the first time... Cosmonaut Alexander Kaleri was talking to flight controllers in Moscow when he heard a loud drum-like noise coming from the instrument panel of the station's Russian-built living quarters. Kaleri and astronaut Michael Foale first heard the mystery noise - described as a flapping sheet of metal - back in late November. Neither the crewmen nor flight controllers were ever able to identify the sound... "It's very strange," Russian Mission Control said. "I doubt that it would be a coincidence that you're hearing the same thing coming from the same place." During a spacewalk in February, Kaleri and Foale were supposed to check the exterior of the space station where the noise originated last November. But Kaleri's spacesuit overheated and became damp, and the spacewalk had to be cut short, so the men did not have time to inspect the area. The fact that Kaleri's investigative spacewalk was not possible as his spacesuit overheated is another result of the electrical effects of the standing wave resonance. While the event has been passed off as the result of 'space junk', NASA directed a spacewalk mission that abruptly failed, yet no link has been drawn between the anomalous acoustic energy heard with the anomalous heating of the astronaut's spacesuit. The infrasound energy that is likely causing the noisy drumming and the overheating of the cosmonaut's spacesuit will likely recur for a longer duration, building an electrical charge capable of rendering the systems of the ISS inoperable. "These are the Signs that great destruction is coming. The world shall rock to and fro. The white man will battle against other people in other lands -- with those who possessed the first light of wisdom. There will be many columns of smoke and fire such as White Feather has seen the white man make in the deserts not far from here. Only those which come will cause disease and a great dying." "Many of my people, understanding the prophecies, shall be safe. Those who stay and live in the places of my people also shall be safe. Then there will be much to rebuild. And soon - very soon afterward - Pahana will return. He shall bring with him the dawn of the Fifth World. He shall plant the seeds of his wisdom in their hearts. Even now the seeds are being planted. These shall smooth the way to the Emergence into the Fifth World." The Hopi prophecy details the order of events to occur, which can be deciphered when combined with the Mayan calendar wisdom which links the Red Dawn prophecy with the end date of 12.22.2012. Thus, the ISS may be interpreted as the sign of the Blue Star Katchina that precedes the 2012 event, like an alarm clock heralding its imminence. The Hopi tell that soon after the fall of the space station will come the appearance of the Red Star Katchina bringing the Day of Purification, when the skies in all lands of the Earth will bleed red. Hopi Elders describe this future cosmic event in simple and clear terms: "a small Red Star which will come very close and sit in our heavens watching us." Now, just wait a minute... stars are not known to wander around and sneak up on anyone! What exactly is being suggested by the Hopi? While it may come as a startling surprise for many, the Hopi description accurately reflects the scenario presented by the Binary Research Institute. Astrophysics is now coming to grips with the reality that our solar system is a binary star system - that we will imminently discover a dark star companion in close proximity to our sun. The binary model is the only one that predicts the extremely elliptical orbit of Sedna, which must be highly influenced by our sun's dark twin to maintain such an orbit. The Hopi sacred prophecies tell of the impending incandescence of a red star in the close vicinity of Earth, describing it as a revelation of the solar twins. The now hidden brown dwarf companion star will soon reach a critical proximity to the sun - its dormant surface will reignite, transforming it into a brilliant red star. The small size and dark brown color of the long-ago extinguished dark twin sun has allowed it to creep on its elliptical path back into close proximity of the solar system without our awareness, and its ignition will likely be triggered by the imminent wave front from the supernova of Betelgeuse. The return of the Blue Star Katchina who is also known as Nan ga sohu will be the alarm clock that tells us of the new day and new way of life, a new world that is coming. This is where the changes will begin. They will start as fires that burn within us, and we will burn up with desires and conflict if we do not remember the original teachings, and return to the peaceful way of life. Not far behind the twins will come the Purifier, the Red Katchina, who will bring the Day of Purification. On this day the Earth, her creatures and all life as we know it will change forever. There will be messengers that will precede this coming of the Purifier. They will leave messages to those on Earth who remember the old ways. The messages will be found written in the living stone, through the sacred grains, and even the waters (Crop Circles have been found in ice). From the Purifier will issue forth a great Red Light. All things will change in their manner of being. Every living thing will be offered the opportunity to change from the largest to the smallest thing. Those who return to the ways given to us in the original teachings, and live a natural way of life will not be touched by the coming of the Purifier. They will survive and build the new world. Only in the ancient teachings will the ability to understand the messages be found. When the Purifier comes we will see him first as a small Red Star which will come very close and sit in our heavens watching us. Watching us to see how well we have remembered the sacred teachings. This Purifier will show us many miraculous signs in our heavens. In this way we will know Creator is not a dream. Even those who do not feel their connection to spirit will see the face of creator across the sky. Things unseen will be felt very strongly. Many things will begin to occur that will not make sense, for reality will be shifting back in and out of the dream state. There will be many doorways to the lower world that will open at this time. Things long forgotten will come back to remind us of our past creations. All living things will want to be present for this day when time ends, and we enter the forever cycle of the Fifth World. We will receive many warnings allowing us to change our ways from below the Earth as well as above. Then, one morning in a moment, we will awaken to the Red Dawn. The sky will be the color of blood, many things will then begin to happen that right now we are not sure of their exact nature. For much of reality will not be as it is now. Hopi culture foretells invisible acoustic changes in the environment and in the hearts of human beings, as "things unseen will be strongly felt." The Elders inform us "the messages will be found written in the living stone, through the sacred grains, and even the waters (Crop Circles have been found in ice)." For decades now, conscious plasma orbs have been forming geometric messages in ice and grain fields, providing coherent mathematical formulas. The most complex quadratic functions were rendered in England, where the Mandelbrot Set [ zn+1 = zn2 + c ] appeared in Ickleton in 1991. Subsequent agroglyphs formed at Lurkley Hill in 2006 and Wayland Smithy in 2008 presented a variation on the fractal formula: [ zn+1 = zn2 ]. Remarkably, this formula exactly describes unusual IR satellite data from 2001. Avebury Manor of July 15, 2008 reminds us that the Mayan Long Count calendar will end on December 23, 2012: by showing precise orbital locations for all nine planets of our solar system on that date, plus an accurate elliptical orbit for Pluto. The indigenous Elders tell us that the messages of change will be received inside all living things, and each will be given an opportunity to change. Russian researchers have used infrasound and light waves to induce DNA transmutation, by which one species is genetically transmuted into another (Gariaev). This discovery provides a new framework for quantum leaps in evolution, whereby quantum shifts from high to low levels of planetary infrasound resonance regulate the expression of DNA in Earth's many lifeforms. New animal species are being encountered that are a sign of planet-wide genetic transmutations now occurring in hotspots of infrasound humming. An unusual new species now recorded often is a mostly hairless variety of purple/grey-skinned canine dubbed the 'hyote' (hyena/coyote), photographed and videotaped in Minnesota, Maryland, Texas and Saudi Arabia. Sightings of various giant species of 'thunderbirds' have also been increasing around the world as species exhibit spontaneous DNA changes. These same infrasound-related DNA changes are expressed in extraordinary human beings who possess profound cosmic knowledge of their pristine origins and the unlimited holographic capabilities enabled by such knowledge. A shining example of this truth is a young woman from the taiga forests of Siberia named Anastasia who has mastered ayurveda - the art of living. Having inheriting the deepest of cosmic wisdom from her Vedruss forefathers, Anastasia provides us with the spiritual information that will germinate the seeds of human divinity now being planted in the fields of the Earth. The voices of the indigenous Elders of the world speak as one, revealing ancient Vedic knowledge of the transdimensional nature of human consciousness to guide our path of ascent into the red light of Oneness. The article in the first post is from Michael Brown. I haven't checked his website in quite some time. Thanks for posting it. It is quite obvious to me that the changes that are occurring in the sun are mirroring the changes that are taking place in humanity's Heart . To me it's not that there is an outside influence out there that makes us able to become a sun of our own by the opening of our Heart but rather Consciousness at large moving to the next level and this will manifest in everything we see around us in a close and far away distance changing our reality as we perceive it in a profound and lasting way. We as Conscious being integrating our divine and core essence are creating those changes without yet realizing it. Blessed are these times we are taking part in. The sun could be a net for dark matter, a new study suggests. If dark matter happens to take a certain specific form, it could build up in our nearest star and alter how heat moves inside it in a way that would be observable from Earth. Dark matter is the mysterious stuff that makes up about 83 percent of the matter in the universe, but doesn’t interact with electromagnetic forces. Although the universe contains five times as much dark matter as normal matter, dark matter is completely invisible both to human eyes and every kind of telescope ever devised. Physicists only know it’s there because of its gravitational effect on normal matter. Dark matter keeps galaxies spinning quickly without flying apart and is responsible for much of the large-scale structure in the universe. Current dark matter detectors are looking for WIMPs, or weakly interacting massive particles, that connect only with the weak nuclear force and gravity. Based on the most widely accepted theories, most experiments are tuned to look for a particle that is about 100 times more massive than a proton. The chief suspect is also its own antiparticle: Whenever a WIMP meets another WIMP, they annihilate each other. “This is something that has always worried me,” said astroparticle physicist Subir Sarkar of the University of Oxford. If equal amounts of matter and antimatter were created in the big bang, the particles should have completely wiped each other out by now. “Obviously that did not happen, we are here to prove it,” he said. “So something created an asymmetry of matter over antimatter,” letting a little bit of matter survive after all the antimatter was gone. Whatever made regular matter beat out regular antimatter could have worked on dark matter as well, Sarkar suggests. If dark matter evolved similarly to regular matter, it would have to be much lighter than current experiments expect, only about 5 times the mass of a proton. That’s a suggestive number, Sarkar says. The trouble is, these light particles are much more difficult to detect with current experiments. In a paper in the July 2 Physical Review Letters, Sarkar and Oxford colleague Mads Frandsen suggest another way to find light dark matter: Look to the sun. Because lightweight dark matter particles wouldn’t vaporize each other when they meet, the sun should collect the particles the way snowballs collect more snow. “The sun has been whizzing around the galaxy for 5 billion years, sweeping up all the dark matter as it goes,” Sarkar said. The buildup of dark matter could solve a pressing problem in solar physics, called the solar composition problem. Sensitive observations of waves on the sun’s surface have revealed that the sun has a much easier time transporting heat from its interior to its surface than standard models predict it should. Dark matter particles that interact only with each other could make up the difference. Photons and particles of regular matter bounce off each other on their way from the sun’s interior to its surface, so light and heat can take billions of years to escape. But because dark matter particles ignore all the regular matter inside the sun, they have less stuff in their way and can transport heat more efficiently. Next, Sarkar and Frandsen calculated how being full of dark matter would affect the number of neutrinos the sun gives off. They found that the neutrino flux would change by a few percent. That’s not much, Sarkar said, but it’s just enough to be detected by two different neutrino experiments — one in Italy called Borexino and one in Canada called SNO+ — that are soon to get under way. Some puzzling results from dark matter detectors hint that these lightweight particles could have already been detected. Earlier this year, a germanium hockey puck in a mine in Minnesota called the Coherent Germanium Neutrino Technology (CoGeNT) detected a signal from a particle about 7 times the mass of the proton, though they’re not sure yet whether it’s dark matter. Another detector in Italy called DAMA has reported similar results. Update: Regular matter makes up 5 percent of the energy density of the universe, and dark matter makes up 25 percent (five times more than regular matter). The remaining 70 percent is dark energy. Researchers from the Institute for Corpuscular Physics (IFIC) and other European groups have studied the effects of the presence of dark matter in the Sun. According to their calculations, low mass dark matter particles could be transferring energy from the core to the external parts of the Sun, which would affect the quantity of neutrinos that reach the Earth. "We assume that the dark matter particles interact weakly with the Sun's atoms, and what we have done is calculate at what level these interactions can occur, in order to better describe the structure and evolution of the Sun", Marco Taoso, researcher at the IFIC, a combined centre of the Spanish National Research Council and the University of Valencia, explains to SINC. The astrophysical observations suggest that our galaxy is situated in a halo of dark matter particles. According to the models, some of these particles, the WIMPs (Weakly Interacting Massive Particles) interact weakly with other normal ones, such as atoms, and could be building up on the inside of stars. The study, recently published in the journal Physical Review D, carries out an in-depth study of the case of the Sun in particular. "When the WIMPs pass through the Sun they can break up the atoms of our star and lose energy. This prevents them from escaping the gravitational force of the Sun which captures them, and they become trapped, orbiting inside it, with no way of escaping", the researcher points out. Scientists believe that the majority of the dark matter particles gather together in the centre of the Sun, but in their elliptic orbits they also travel to the outer part, interacting and exchanging with the solar atoms. In this way, the WIMPs transport the energy from the burning central core to the cooler peripheral parts. "This effect produces a cooling down of the core, the region from where the neutrinos originate due to the nuclear reactions of the Sun", Taoso points out. "And this corresponds to a reduction in the flux of solar neutrinos, since these depend greatly on the temperature of the core". The neutrinos that reach the Earth can be measured by means of different techniques. These data can be used to detect the modifications of the solar temperature caused by the WIMPs. The transport of energy by these particles depends on the likelihood of them interacting with the atoms, and the "size" of these interactions is related to the reduction in the neutrino flux. "As a result, current data about solar neutrinos can be used to put limits on the extent of the interactions between dark matter and atoms, and using numerical codes we have proved that certain values correspond to a reduction in the flux of solar neutrinos and clash with the measurements", the scientist reveals. The team has applied their calculations to better understand the effects of low mass dark matter particles (between 4 and 10 gigaelectronvolts). At this level we find models that attempt to explain the results of experiments such as DAMA (beneath an Italian mountain) or CoGent (in a mine in the USA), which look for dark material using "scintillators" or WIMP detectors. This year another study by scientists from Oxford University (United Kingdom) also appeared. It states that WIMPs not only reduce the fluxes of solar neutrinos, but also, furthermore, modify the structure of the Sun and can explain its composition. "Our calculations, however, show that the modifications of the star's structure are too small to support this claim and that the WIMPs cannot explain the problem of the composition of the sun", Taoso concludes. Ooooh .. Carol... awesome picture of the Sun . "The August 1st event really opened our eyes," says Karel Schrijver of Lockheed Martin’s Solar and Astrophysics Lab in Palo Alto, CA. "We see that solar storms can be global events, playing out on scales we scarcely imagined before." For the past three months, Schrijver has been working with fellow Lockheed-Martin solar physicist Alan Title to understand what happened during the "Great Eruption." They had plenty of data: The event was recorded in unprecedented detail by NASA's Solar Dynamics Observatory and twin STEREO spacecraft. With several colleagues present to offer commentary, they outlined their findings at a press conference today at the American Geophysical Union meeting in San Francisco. Explosions on the sun are not localized or isolated events, they announced. Instead, solar activity is interconnected by magnetism over breathtaking distances. Solar flares, tsunamis, coronal mass ejections--they can go off all at once, hundreds of thousands of miles apart, in a dizzyingly-complex concert of mayhem. "To predict eruptions we can no longer focus on the magnetic fields of isolated active regions," says Title, "we have to know the surface magnetic field of practically the entire sun." This revelation increases the work load for space weather forecasters, but it also increases the potential accuracy of their forecasts. 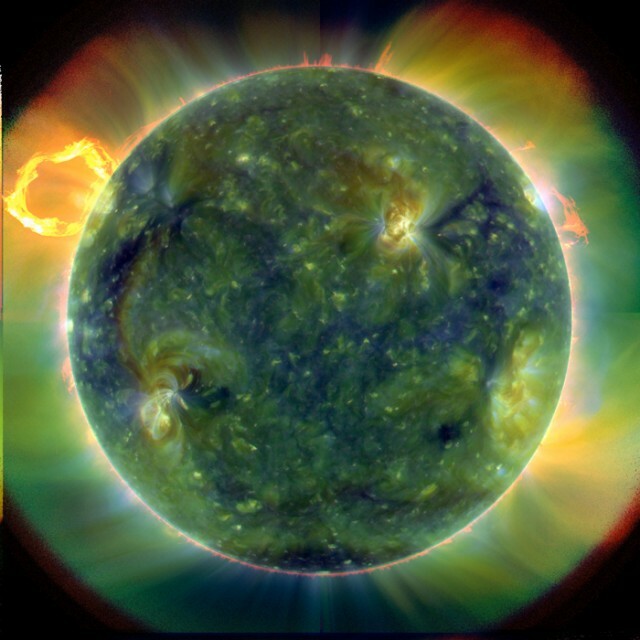 "The whole-sun approach could lead to breakthroughs in predicting solar activity," commented Rodney Viereck of NOAA's Space Weather Prediction Center in Boulder, CO. "This in turn would provide improved forecasts to our customers such as electric power grid operators and commercial airlines, who could take action to protect their systems and ensure the safety of passengers and crew." In a paper they prepared for the Journal of Geophysical Research (JGR), Schrijver and Title broke down the Great Eruption into more than a dozen significant shock waves, flares, filament eruptions, and CMEs spanning 180 degrees of solar longitude and 28 hours of time. At first it seemed to be a cacophony of disorder until they plotted the events on a map of the sun's magnetic field. Title describes the Eureka! moment: "We saw that all the events of substantial coronal activity were connected by a wide-ranging system of separatrices, separators, and quasi-separatrix layers." A "separatrix" is a magnetic fault zone where small changes in surrounding plasma currents can set off big electromagnetic storms. Researchers have long suspected this kind of magnetic connection was possible. "The notion of 'sympathetic' flares goes back at least three quarters of a century," they wrote in their JGR paper. Sometimes observers would see flares going off one after another--like popcorn--but it was impossible to prove a link between them. Arguments in favor of cause and effect were statistical and often full of doubt. "For this kind of work, SDO and STEREO are game-changers," says Lika Guhathakurta, NASA's Living with a Star Program Scientist. "Together, the three spacecraft monitor 97% of the sun, allowing researchers to see connections that they could only guess at in the past." To wit, barely two-thirds of the August event was visible from Earth, yet all of it could be seen by the SDO-STEREO fleet. Moreover, SDO's measurements of the sun's magnetic field revealed direct connections between the various components of the Great Eruption—no statistics required. Much remains to be done. "We're still sorting out cause and effect," says Schrijver. "Was the event one big chain reaction, in which one eruption triggered another--bang, bang, bang--in sequence? Or did everything go off together as a consequence of some greater change in the sun's global magnetic field?" Further analysis may yet reveal the underlying trigger; for now, the team is still wrapping their minds around the global character of solar activity. One commentator recalled the old adage of three blind men describing an elephant--one by feeling the trunk, one by holding the tail, and another by sniffing a toenail. Studying the sun one sunspot at a time may be just as limiting. "Not all eruptions are going to be global," notes Guhathakurta. "But the global character of solar activity can no longer be ignored." As if the sun wasn't big enough already…. and--snap!--erupted. NASA's Solar Dynamics Observatory recorded the action. Wow, Carol! You been busy! Lots of good information to ponder. 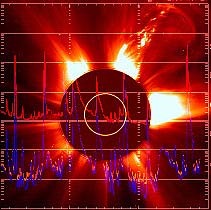 "flares: sudden short-lived brightening of the Sun's upper chromosphere/inner corona. They represent an explosive release of energy that causes a heating of the surrounding area. Right before the sun burns out, you may see one of these. Don't look directly into the flare, and by all means make sure to duck." Possible strong quakes and tsunamis expected within the next few days.